‘Tis the day before Christmas, and all through the house, no one is ready, not even the mouse! Merry Christmas Eve! I hope you’re spending today relaxing by a twinkling tree, sipping hot cocoa while admiring your beautifully wrapped gifts & clean house, as your perfectly dressed children play quietly on the hearth. Because that’s totally what I’m doing – in some alternate universe. In reality, I’ll be doing some last-minute baking, cleaning, & gift wrapping. Oh, except for that one gift that still. hasn’t. shipped. There’s always one. Either I waited too long to order it (not me! never! ), or the gift that I ordered weeks ago in spite of a sketchy shipping projection is still sitting in a warehouse somewhere gathering dust. This year that gift is for my dad, & my brother & I have been anxiously waiting for a shipping notification that never came. Best case scenario now looks like a December 27 arrival. Perfect. My dad is impossible to surprise. The man can pick up any package under the tree that has his name on it, look at it for a second, then tell you exactly what’s in it. It’s infuriating. This year, we were sure we had him. He would never guess this one. But as the 25th got closer & closer, we started to suspect we needed a plan B. While debating on whether or not to wrap a picture of the soon-to-be-here-I-promise gift, and thereby ruin the surprise, I decided that what we really needed was a rain check. 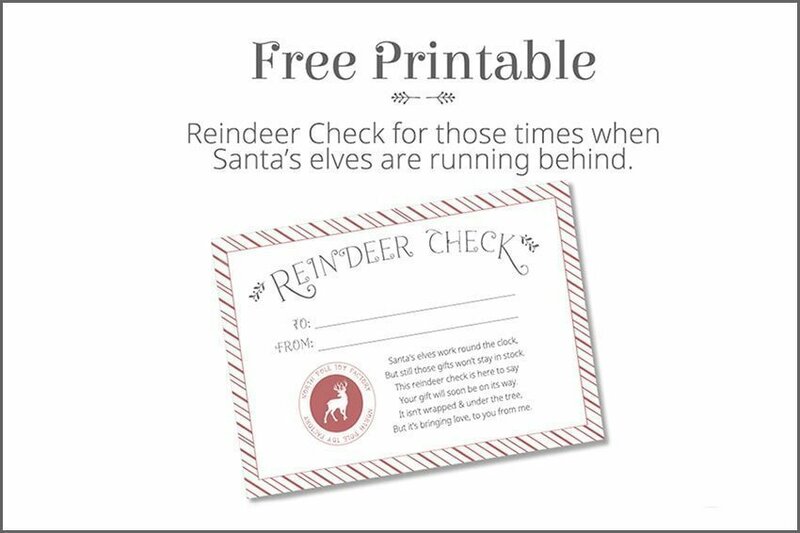 Or a reindeer check. Because really, it’s the reindeer delivery system that’s at fault here. So I came up with something to print out for those times when Santa’s elves are hopelessly behind, & that gift just isn’t going to make it under the tree. Just in case you ever find yourself in the same predicament (but you won’t, because you are always organized & on top of these things, right? ), here’s a free download for you. If you want, you could even include a hint about what the gift might be. But not us. This year we are going to surprise you, Dad! Well, beyond the fact that your Christmas gift is, in fact, not going to be here on Christmas. Surprise! Wishing you and yours a very Merry Christmas & a Happy New Year full of only the best kind of surprises! Previous Post: « Hello March!